Motoring through Britain is a great way to see the sights. Guest contributors John and Sandra recently flew to Britain to watch their son receive his Doctor of Education degree at the University of Liverpool. He’d never been to Scotland and persuaded them to continue on to Edinburgh for a long but very rewarding road trip. It’s usually not a good idea to drink Scotch before noon. But we’re in Edinburgh and the Whisky Master Class starts at 10AM…so we’re happily committed. The Scotch Whisky Experience is one of the top tourist draws in this historic city, especially since it’s located at the beginning of the Royal Mile, at the foot of Edinburgh Castle. It includes a Disney-like ride in huge barrels that winds through the distillation and maturation process, a visit to the biggest whisky collection in the world and a presentation by Max, our guide, on the varied and distinct aromas found in different Scotches. At the end we had a chance to sample four wee drams (all quite distinct) of the complex elixir that made Scotland famous. Our British adventure started with a flight to London, a rental car (remember, keep left!) and a pleasant drive through the English countryside to Liverpool. This seaport city of a half million, located on the Mersey River Estuary, was a major port of departure for Irish and English emigrants in the 19th century. It was home to both Cunard and its rival, White Star Line, and the port of registry for the liners Titanic, Lusitania and Queen Mary. That remarkable nautical history is recounted in the extensive Merseyside Maritime Museum on Albert Dock with many displays about the ill-fated Titanic and its connection to Liverpool (many crewmembers were Liverpudlians). There’s even a Titanic lifejacket and some crockery that was brought up from the wreck. Lesser known but equally interesting is the floor dedicated to Lusitania, the giant Cunard liner (once the world’s biggest passenger ship) that was torpedoed off the coast of Ireland by a German submarine in 1915. Almost 1200 lives were lost. The Cunard Building at Albert Dock is also home to the British Music Experience, a national museum dedicated to the rich history of popular music in Britain over the past 70 years, from Cliff Richard to Elton John and the Rolling Stones. They include a stage with a virtual hologram performance (we loved Boy George), David Bowie outfits and a booth where, with flashing lights, you’re taught dance moves from rave to disco to punk. One popular section is loaded with instruments where you can pick up a Gibson or Fender guitar, play the drums or tinkle a keyboard with an instructional video to guide you. 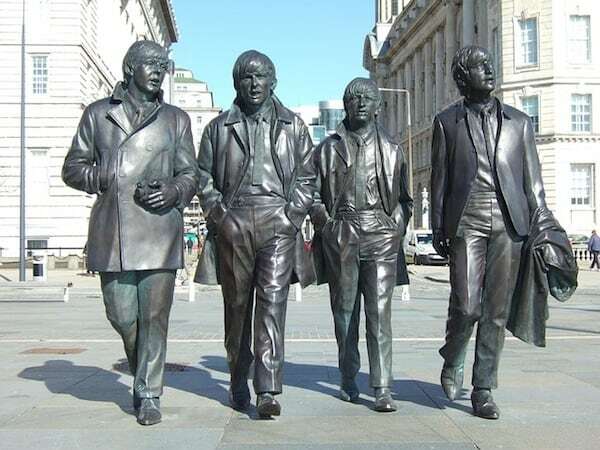 Naturally, the Beatles form a key part of this museum but the remarkable influence of these four Liverpool lads is seen all over town. The most complete exhibit is The Beatles Story, also in the Albert Dock area. A series of rooms showcase their humble beginnings, greatest hits and profound influence on popular music. Many of their original costumes are on display plus plenty of music clips (including the history-making Ed Sullivan appearance). From Albert Dock one can also hop aboard the Magical Mystery Tour bus to visit sites like Penny Lane and Strawberry Fields plus the boyhood homes (exterior only) of each of the performers. The tour ends near the legendary Cavern Club and its continuous live music in the Beatles tradition. Our accommodation in Liverpool was also historic – The Titanic Hotel, a converted brick rum warehouse in Stanley Dock, just along the Mersey from Albert Dock. It had large, comfortable rooms with high, vaulted ceilings and free wi-fi. Its restaurant, Stanley’s, was excellent. Other meals we enjoyed were at Slim’s Pork Chop (who knew England had authentic BBQ? ), the London Carriage Works (British lamb is unbeatable) and a delightful lunch/afternoon tea at Oh Me Oh My. Located in the former Bank of West Africa, it offers a selection of 20 loose teas plus wonderful pastries and traditional sandwiches. We loved Liverpool but decided to head north through the land of the sheep (wow, there are a lot of sheep) to Scotland and Edinburgh, its capital since the 15th century. Its signature tourist area is the Royal Mile, a delightful collection of shops, restaurants, street performers and attractions bookended by Edinburgh Castle at the top and Holyrood Palace (official Scottish residence of the Royal Family) at the bottom. Our first stop, after checking in to the Knight Residence (excellent, clean housekeeping apartments close to the Royal Mile) was the Palace of Holyroodhouse. An audio guide is included with a paid entry and it’s valuable as you admire the lavish rooms used by Mary, Queen of Scots centuries ago and now by Queen Elizabeth and her kin. Adjacent to the palace are the ruins of the Abbey, dating from 1128, and a wonderful, lush garden with walking paths where the Queen holds her annual garden party. Edinburgh Castle, at the opposite end of the Royal Mile and dominating the city’s skyline, is much more crowded than the Palace but a must-see attraction. The castle has been a fortified fixture on the rock since the 12th century. Historians have identified at least 26 sieges in the current 1100 year history of the castle. That history includes the oldest surviving building in Edinburgh, St. Margaret’s Chapel, completed in 1153. Like historic forts around the world, there’s a daily firing, the One O’Clock Gun, from a 25-pounder cannon. The Gun is usually the signal for lunch and we were delighted by the number of places along the Royal Mile that offered both traditional fish & chips and haggis. In the evening, we went farther afield to the Scran and Scallie, an upscale gastropub with remarkably good food. Founded by a Michelin-starred chef and a 2017 winner of a Michelin Guide Bib Gourmand (for “exceptional food at moderate prices”), basic pub food is elevated several steps up in taste and creativity. Its haggis was wonderful and both the beef pie and fish pie were as good as it gets. When you travel this far, a gourmet splurge is needed. So we headed to a grand Georgian townhouse and 21212, the Michelin-starred dining room run by celebrity chef Paul Kitching. He’s know for innovation and it’s amazing to see his band of open-kitchen chefs huddled around a table adding creative touches to extraordinary food. Every dish is a creative masterpiece with an explosion of flavours. One of our appetizers called “Smoked Egg Shells” featured salmon, quail eggs, caviar, foam, mini corn chips and neeps (turnips). A decadent dessert called “Snapped Ginger” included rhubarb and ginger compote, sweetcorn, cashews and trifle. Along with the Scotch Whisky Experience it was the tastiest of ways to remember this remarkable city. It’s a long drive from Edinburgh to London and our flight home but the roads are good (but crowded) with pleasant vistas along the way. We booked a Heathrow Airport hotel, the Double Tree by Hilton, that was very comfortable and convenient. Best of all, it’s about 100 metres from one of London’s remarkably good Indian restaurants, Priya’s Tandoori. Small and unassuming, its authentic Indian food was as good as any we’ve had in Asia or Europe. **All photos by the Nowlans except for the photo of the Beatles statue. Sounds like a wonderful trip. I also liked the cannon being set off at one o’clock exactly every day from Scotland’s Edinburgh Castle, which is a beautiful, magnificent and mysterious historical castle. Rose Street, Edinburgh is also a great place to visit with wonderful Scottish Celtic Pubs and lots of interesting shops. Also, historic Victoria Street with its curves and high street terraces has been designated as an Edinburgh World Heritage site. And yes, there are lots of sheep in the country side. It’s interesting to read about the history of the Highland Clearances and the outing of people, and the intro of vast numbers of sheep. Quite a history! Simply a beautiful country with warmhearted, friendly and welcoming people. Well worth a visit. Thanks Lauren. Every corner of Great Briitain is full of remarkable sights…and people. Thanks for this great travelogue. I’ve always wanted to know more about Liverpool (wondering whether it was worth seeing) and what it would be like to drive all the way from London to Edinburgh and your article answers both of those questions! All the restaurant and hotel tips are big bonuses. Will print this out for my Britain file…. Thank you Laura. Delighted that the article helped your British travel planning. This article is a delight! A Client this year booked their ‘Walking thru the Beatles Footsteps’ custom tour with me, and we included your museum suggestions in Liverpool, but I put them up at the “Hard Days Night” hotel. And while in London, they of course visited Abbey Road Studios and did a London Walks (walks.com) Beatles tour. Thank you for the tip about the Titanic hotel – I’ll try this one next time. So pleased the article was useful. Thank you!